Hello there Peeps! 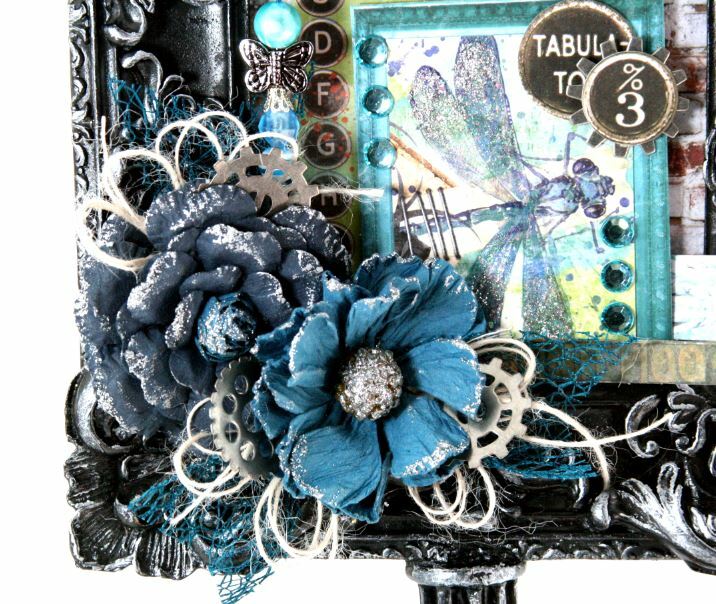 I’m sharing the project I created for BoBunny for Mixed Media Monday which I interpret to mean get alllllll the mixed media supplies out lol. 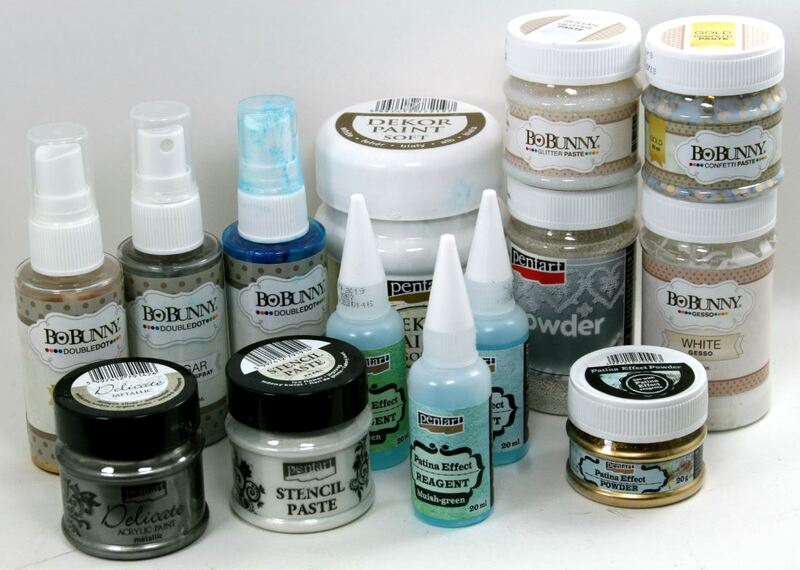 Okay I didn’t use all of them….but there’s a really nice variety of BoBunny and Pentart supplies. I also want to mention that I didn’t get it all over myself and my clothes which is a first. 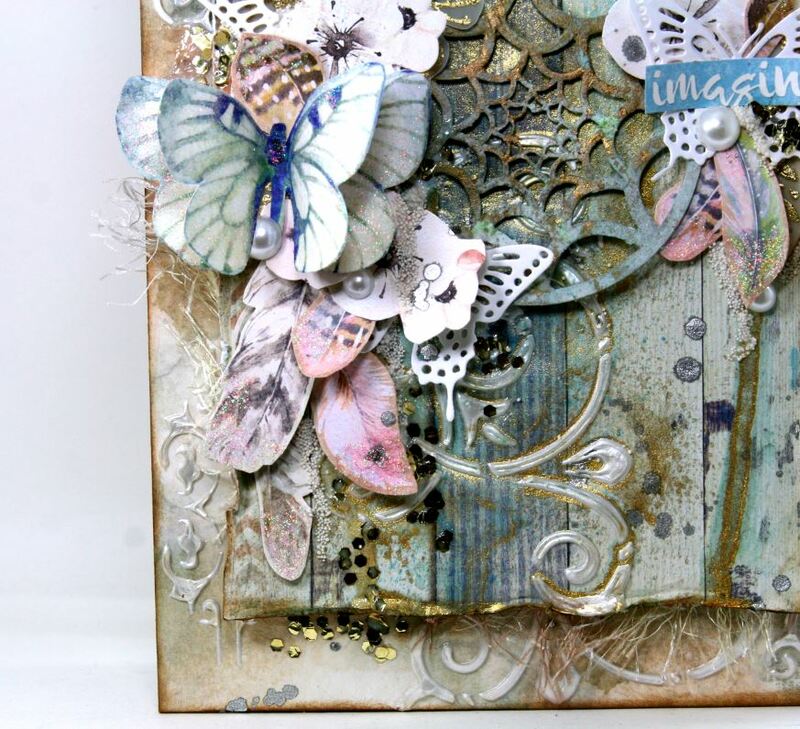 I was inspired by the gorgeous butterfly image in the Serendipity collection. I cut it out twice then stacked them up to create a dimensional effect. 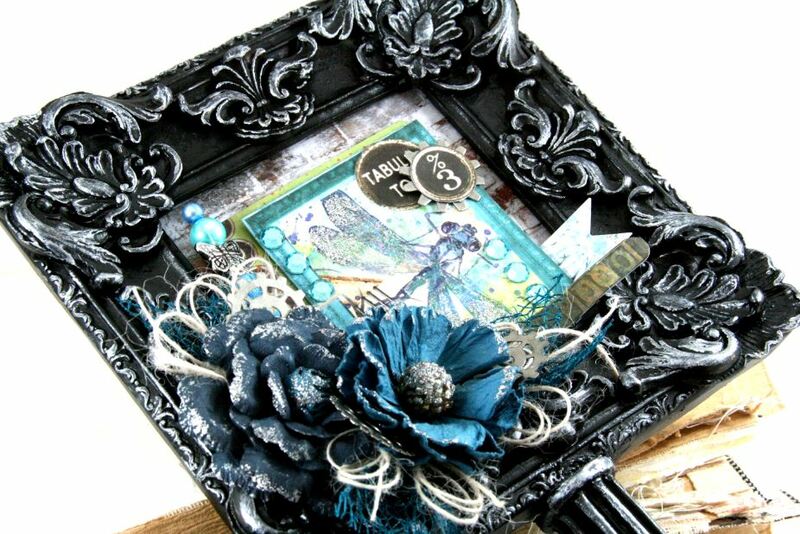 Loads of feathers fussy cut and accented with Sugar Glitter Paste. I used spacers to added depth. 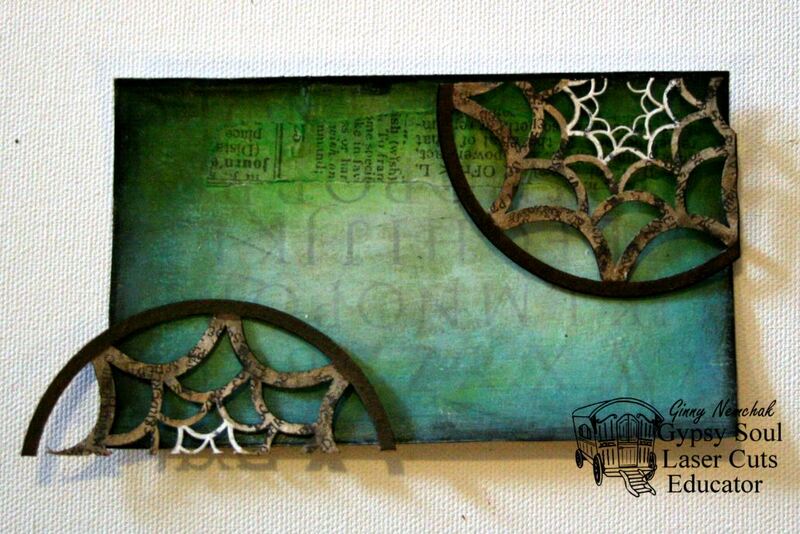 The background pattern was created with the Fancy Flourishes Stencil and Pearl Stencil Paste then sprayed with multiple colors of Glimmer Spray to create an antique effect. I also added some 3D powder and Gold Confetti Paste. 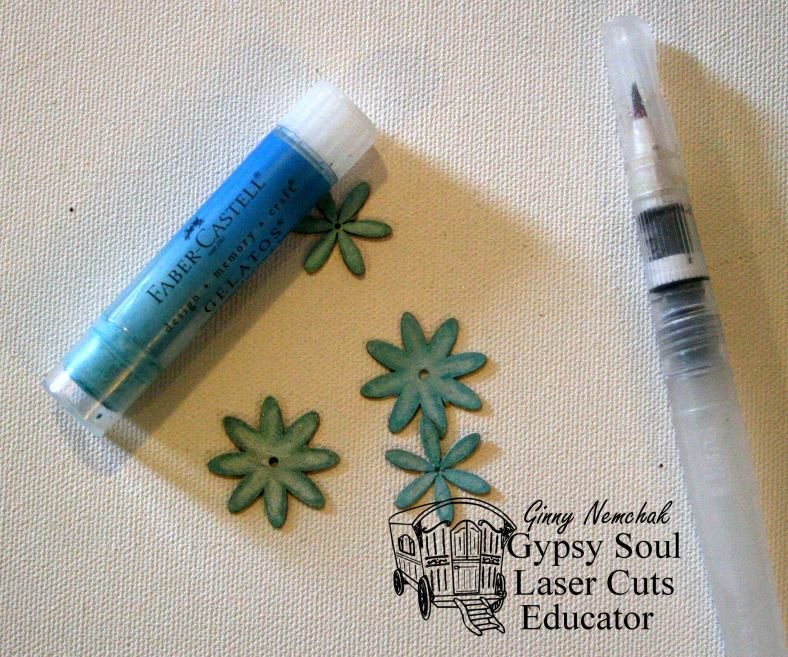 Stamping the Pocket Full of Posies image onto vellum then cut out to create filler for the arrangement. 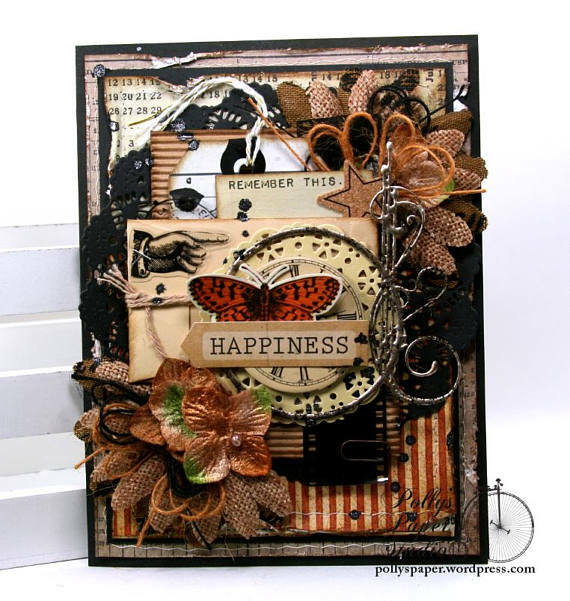 The Flutter Dies butterfly die cuts are substituted for leaves and create a neutral place for your eyes to land on in the busy mix of supplies. A few Double Dot Pearls tucked in are a nice contrast to the metallic paint splatter. This dream catcher chippie was altered with Patina Effects and oh my goodness I love it so much. 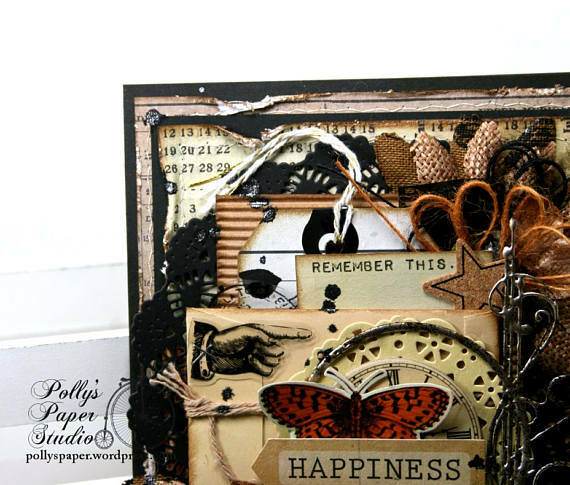 A simple sentiment trimmed from the butterfly cut apart is an inspirational finishing touch. Hey Peeps! 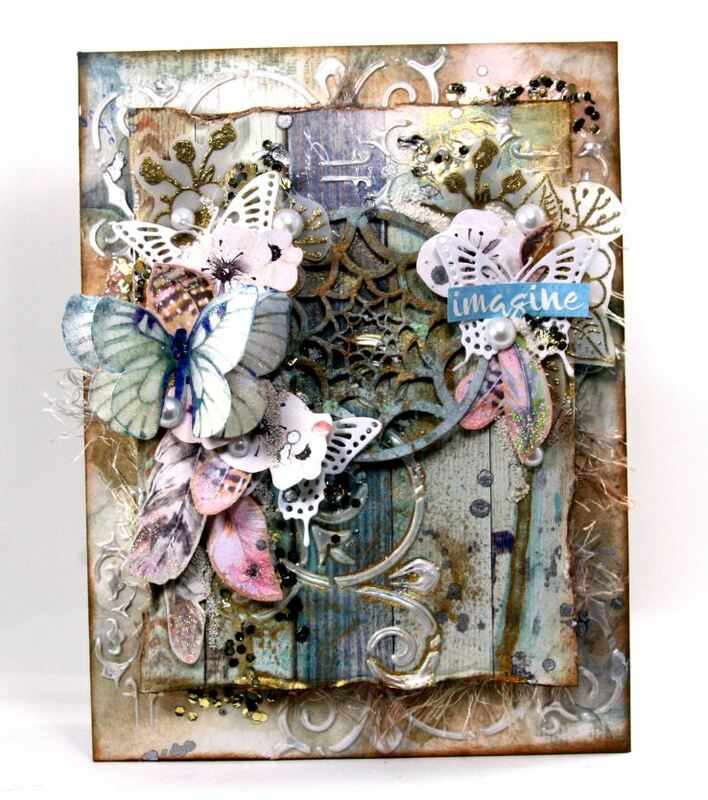 Ginny here to share a card that I created with sooo many layers. All the fabulous supplies were just calling to me. 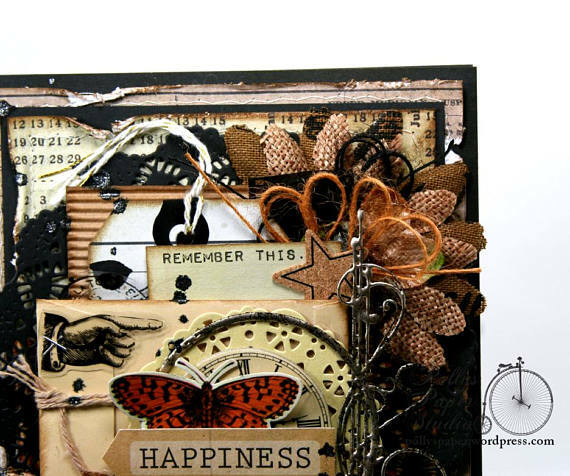 I’ve gone just a bit mixed media and a whole lot vintage with this all occasion greeting card. 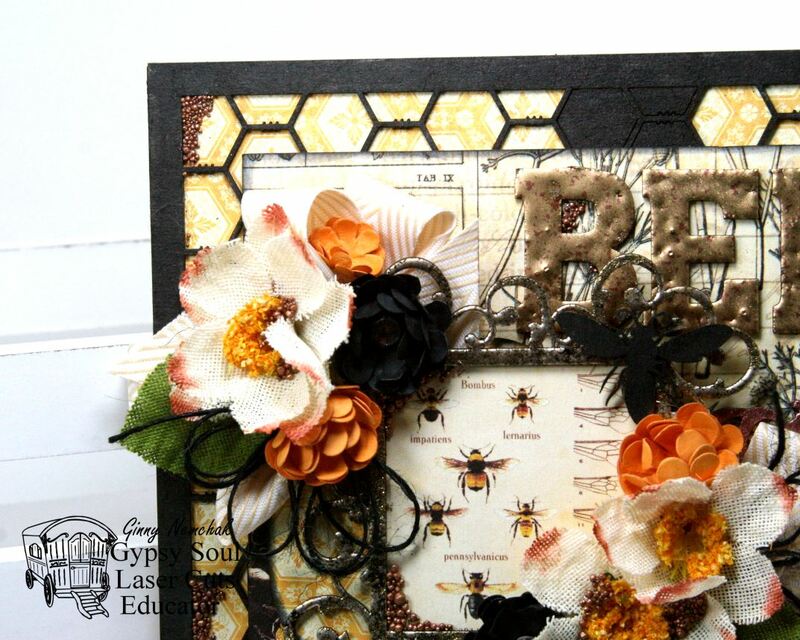 There’s 2 colors of gorgeous Burlap Sting tucked into the flowers. Stitching adds a nice texture and a subtle detail. So.Many.Layers. 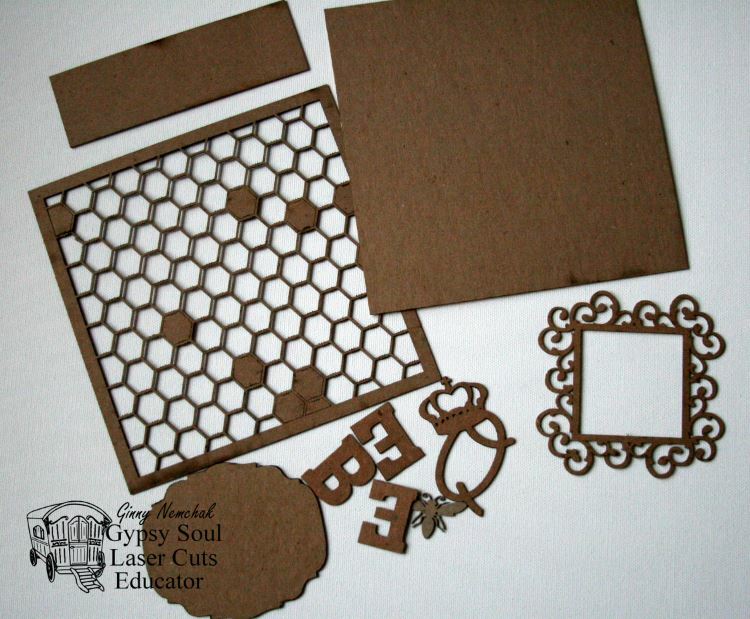 An altered chipboard element to dress up the focal image. Believe it or not…all of these yummy pieces were just regular stash waiting to find a nice home. 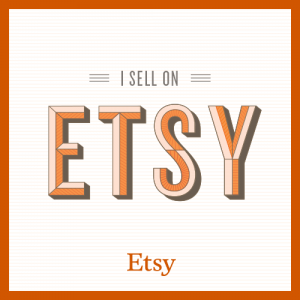 Really Reasonable Ribbon Supplies~ Burlap String in Black and Antique Gold. 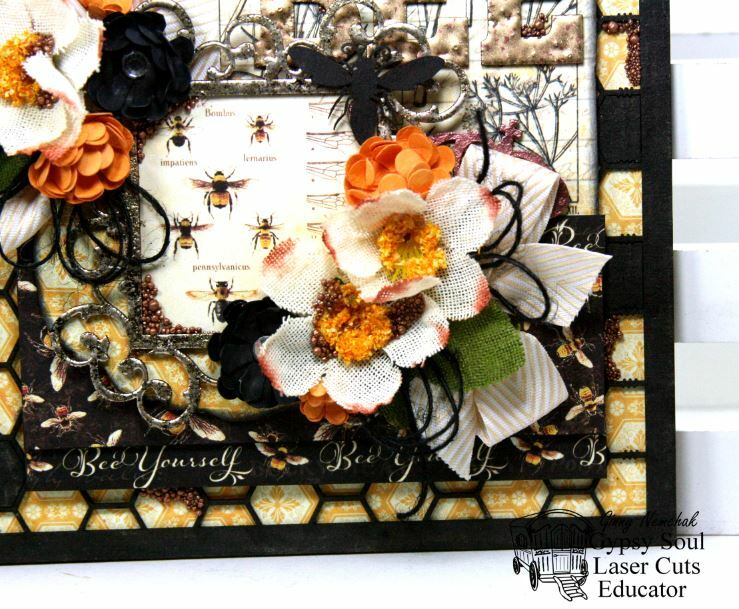 Scor-Tape, Tombow 3D foam Squares. 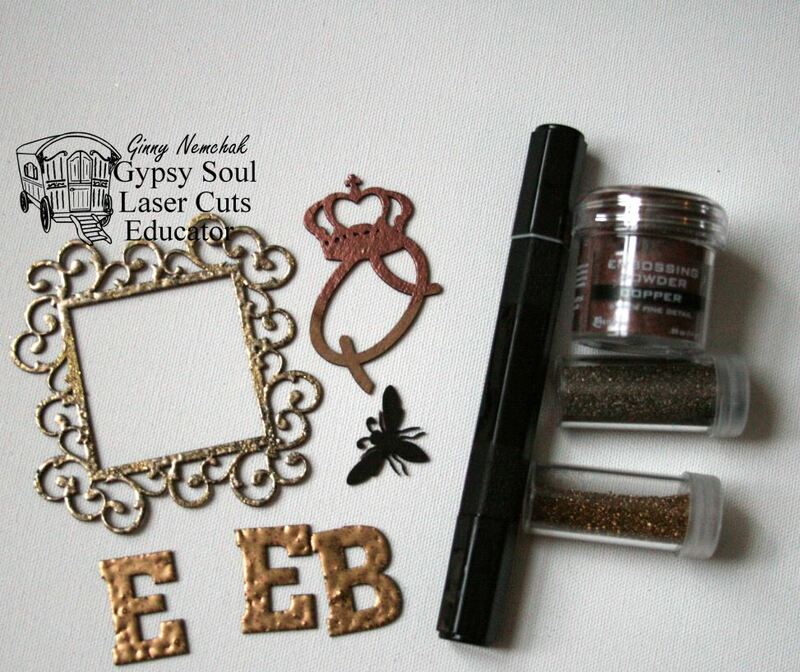 All these fabby elements will be wiped with a cloth to prepare them for finishing. 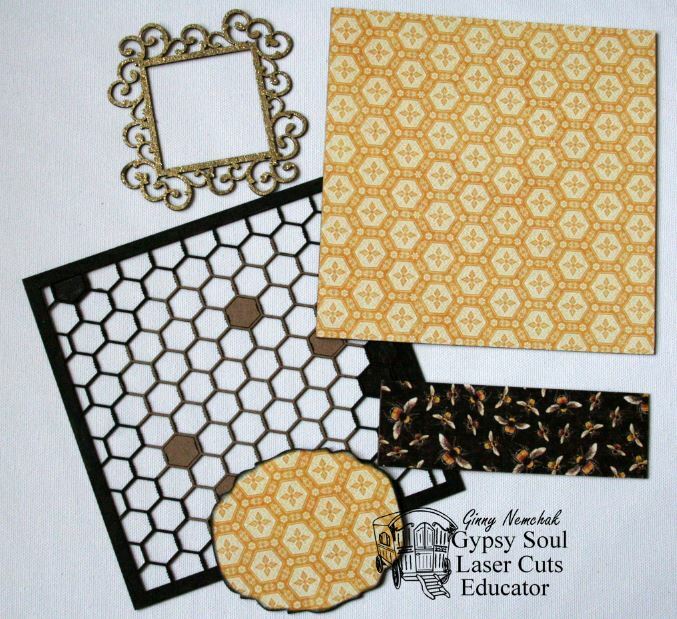 Some of the pieces have been finished in patterned papers. Some have been inked black and some have been heat embossed. 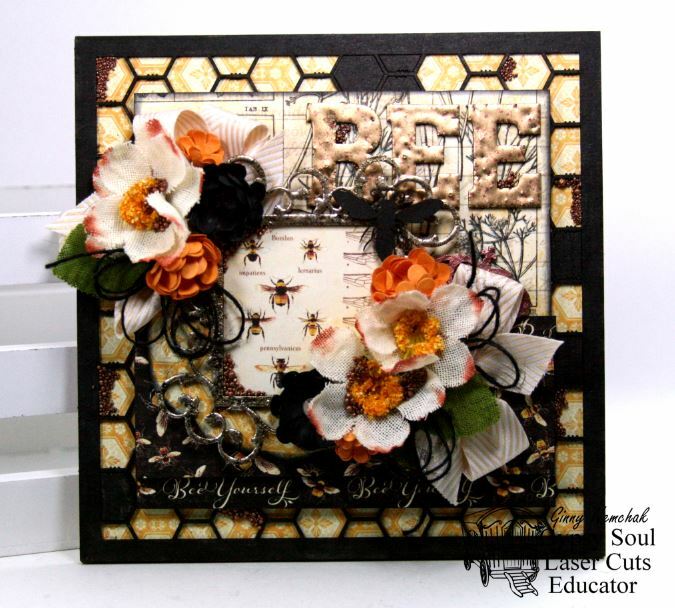 A variety of embossing was done in metallic shades and the bee was just colored with a Spectrum Noir marker. 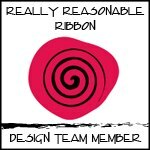 Really Reasonable Ribbon~ Champagne Chevron Striped Twill, Black Burlap String. Hey Peeps! Let me just tell you that I have fallen for the Pentart Metallic Wax Paste. 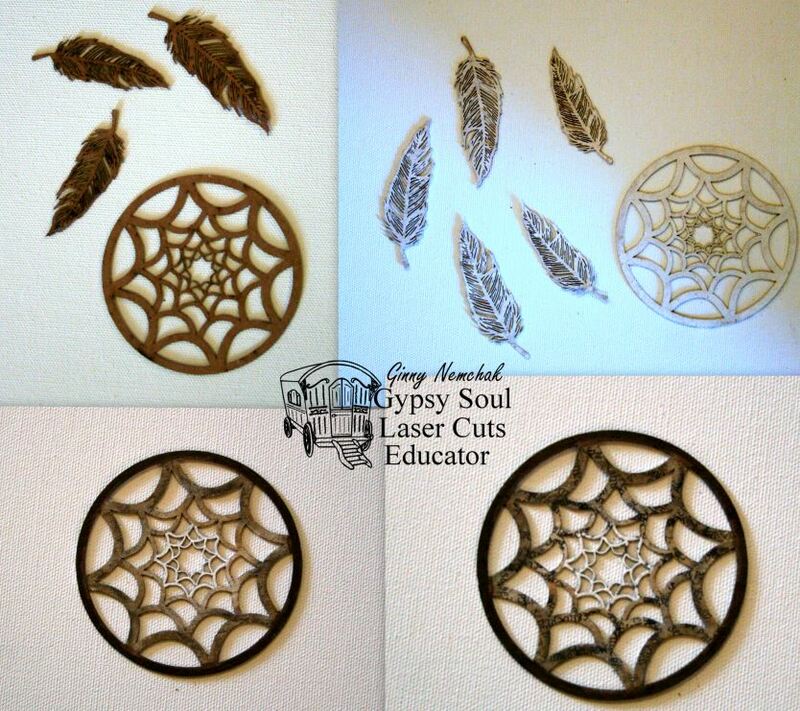 Not only does it add a gorgeous detail to your creations…but it is also super easy to use. For my project today I’m upcycling a plaster frame stand that I sourced at a local discount store in the markdown section. Life In Color was the perfect pairing for this frame. It’s kinda “arty” so I think the mixed media supplies work so great with it. 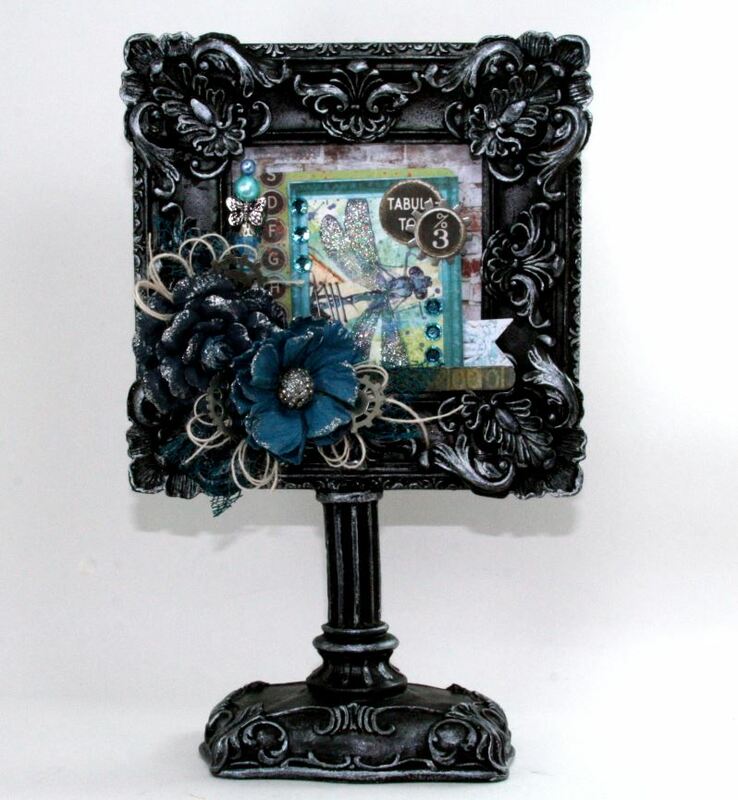 This frame has a lovely base with additional raised areas to highlight with the wax. It’s also super heavy so there is no concern that it might tip over. To round out the arrangement there’s a bit of netting and twine bows. Last but not least metal gears in coordinating silver. I took out the glass part of the frame so I could add the brick background pattern then adhere the following layers with foam spacers. Bling is always a good for an well placed bit of sparkle. These coordinate really well so the don’t contrast with the background. So many layers!!!! 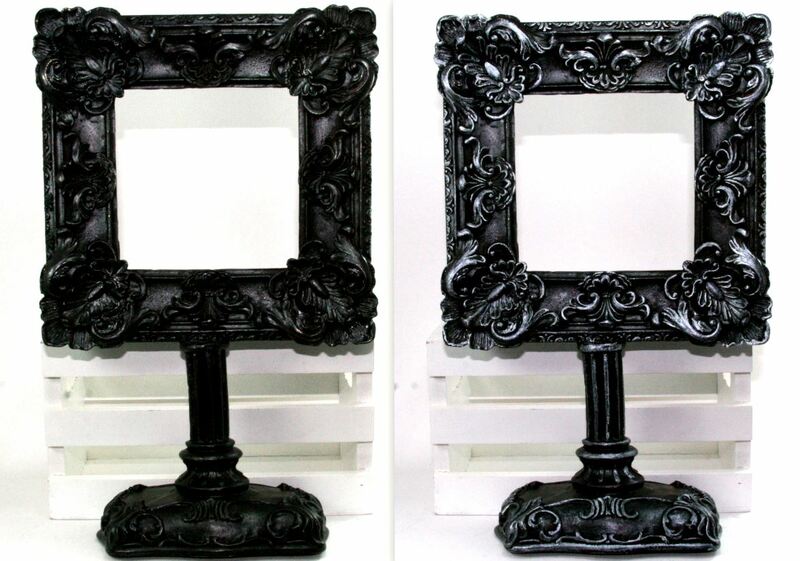 This definitely has a very dimensional look, and the wax paste does the trick in making them stand out nicely. 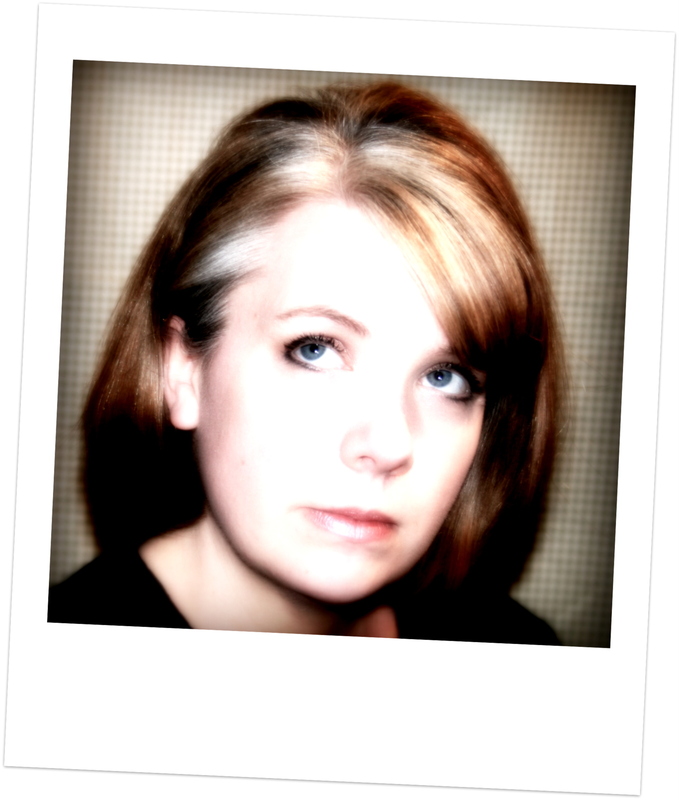 Here’s the process of finishing the frame…. I was able to cover it in with only 1 coat of Pentart Creamy Acrylic Metallic Paint in Graphite. Yay for 1 coat!!!! After allowing to dry I used my finger and a very light touch to add the wax to the raised areas. Easy Peasy. So much beauty for so little work!!! Okay that’s all for me today. 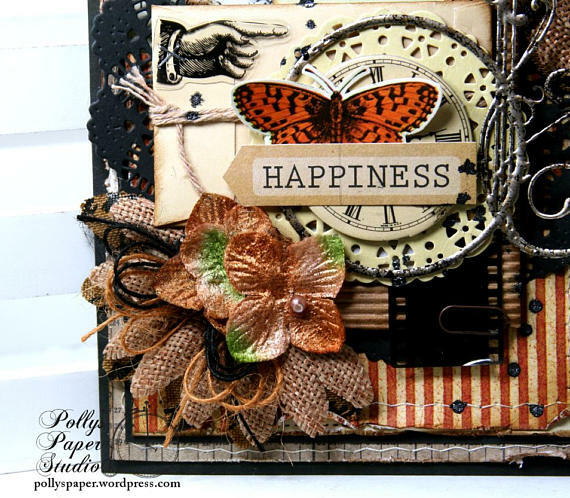 Wishing everyone a happy and productive day with lots of time to be creative. Hey there Peeps! 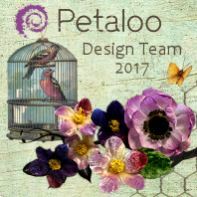 So let me tell you I have been bitten by the ICAD bug. 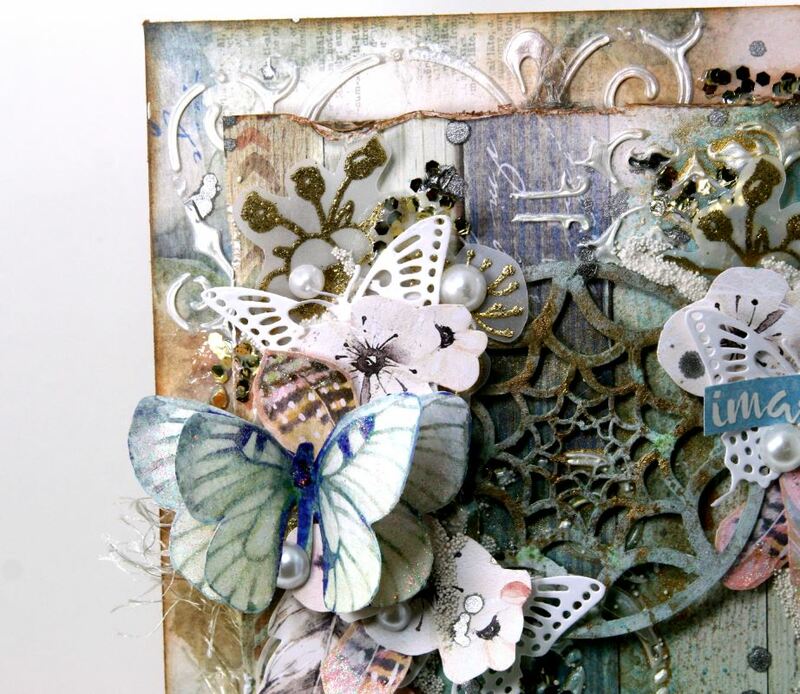 I’m creating a mixed media inspired index card every day to enjoy some fun crafty time and to expand my skills working with mixed media supplies. 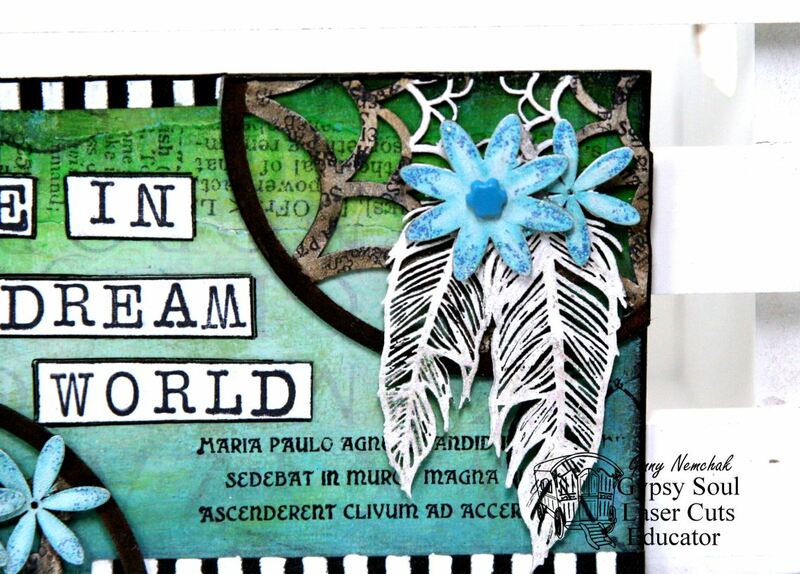 This card was inspired by the gorgeous Dreamcatcher with feathers and a thoughtful quote….Live in a Dream World. So this index card is a standard 3 x 5 inches. 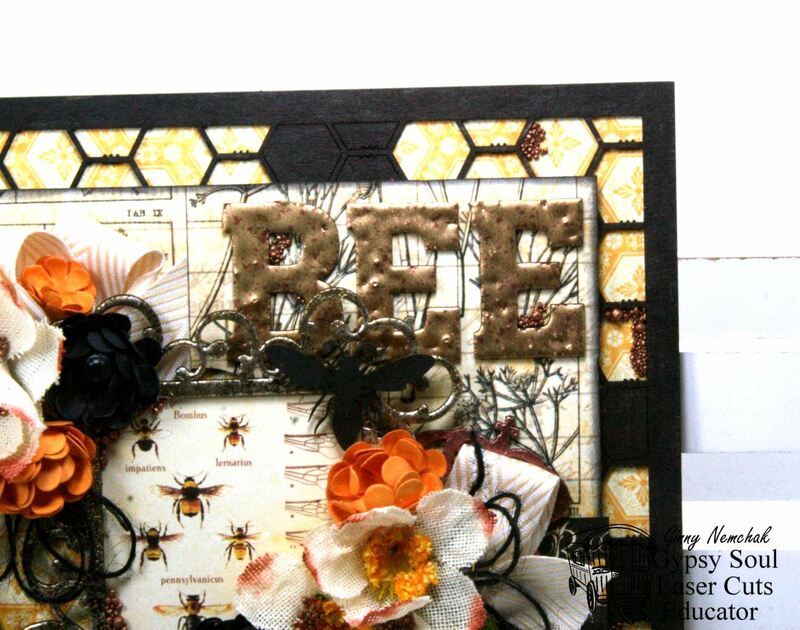 I gave it a generous coat of Mod Podge then applied a text printed background tissue paper. Next a layer of Gesso to knock back the pattern. Gelato’s create the bright colors and very blended background. The Dreamcatcher chippie is creating a nice balance on the corners. 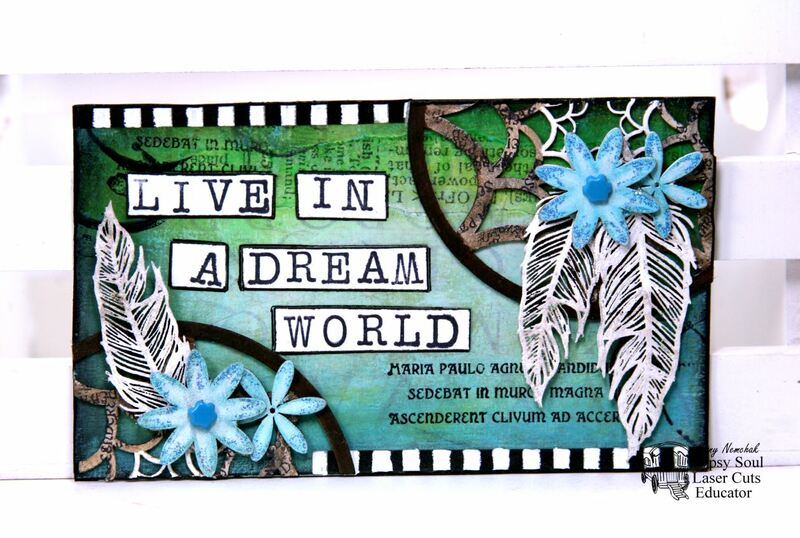 I chose the sentiment to tie into the chippie….the dream world in the Dreamcatcher. Keeping the feathers white brightens up the arrangement. I selected the chippies and gave them a basecoat of flat white acrylic paint. Next I added Gelato’s with the center remaining white and the colors getting darker as it goes out. 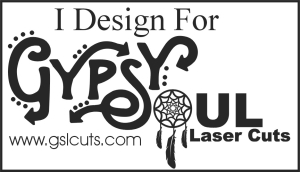 Using a small text stamp I detailed the lighter sections with a random pressing of the stamp. I clipped the hoop into two sections adding one to the top and one to the bottom. Tombo Multi was a great adhesive to attach the thinner sections. After attaching the feathers I decided to top them off with a few little flowers that were finished with more Gelato’s and a water brush. Adding a tiny brad to the center is last but not least. 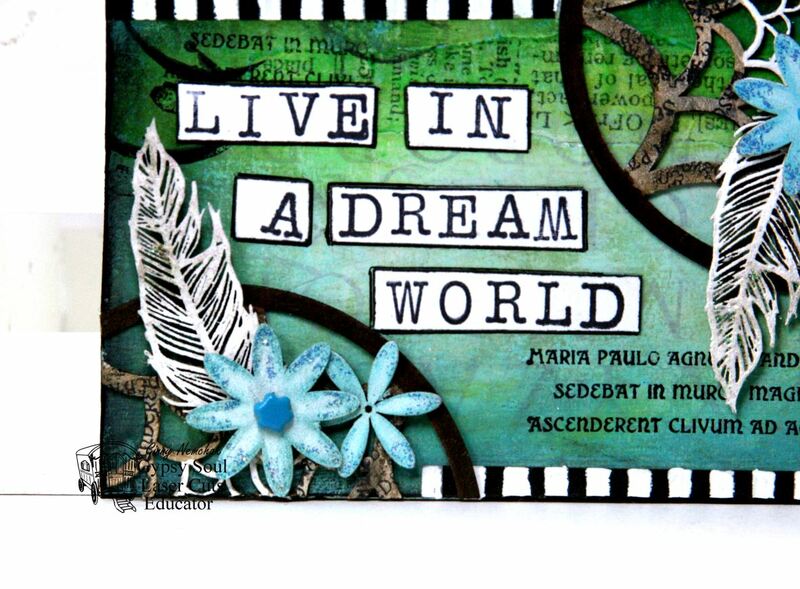 I’ll be adding this card to my collection of ICAD and maybe even do a little journaling to the backs. Hey there Peeps! Well if you’re following me on Instagram you will know that I have been having a good ol time creating card for my ICAD or Index Card A Day. 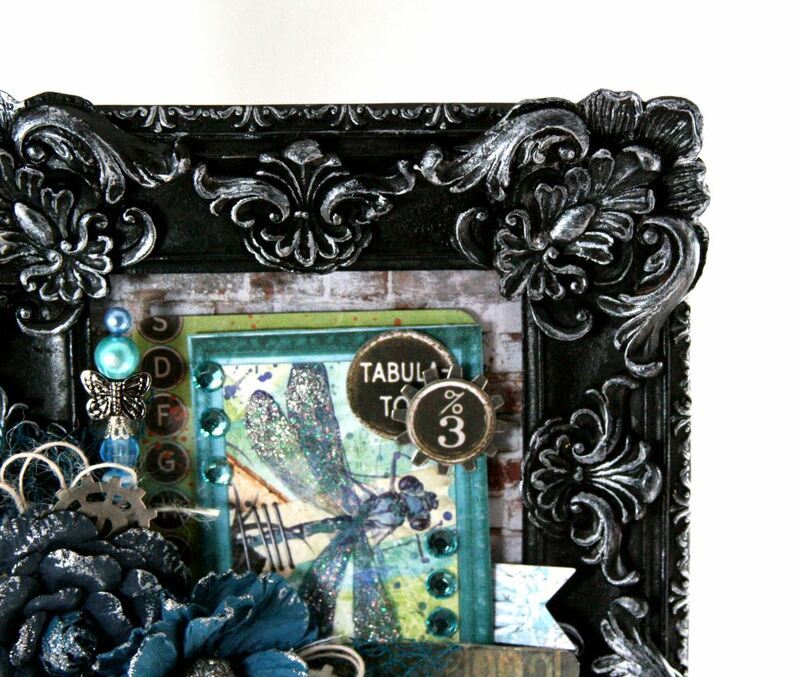 I’m practicing with my mixed media supplies and creating art that’s just for fun. I decided I needed a place to keep all my little artworks so I created the box with an upcycled recipe box and the new Faith Collection from BoBunny. I gave the box a basecoat of the Creamy Acrylic Black Paint by Pentart. This is so rich and creamy it takes only one coat!!! 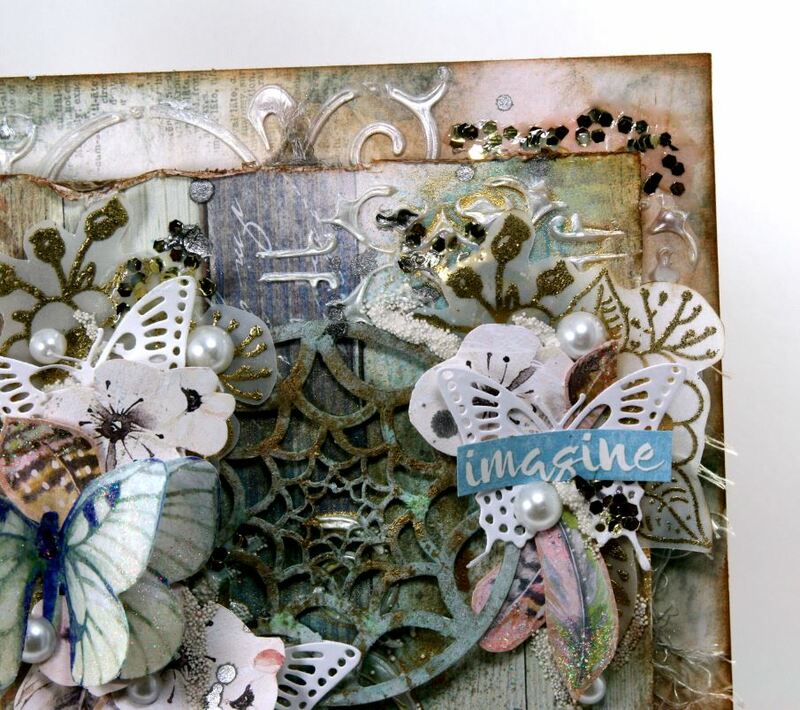 Layers of the patterned papers with Layered Chipboard Stickers, die cuts, stamping, and pearly accents. The box is finished on the inside as well. I switched to the 6 x 6 paper pad to utilize the smaller patterns. 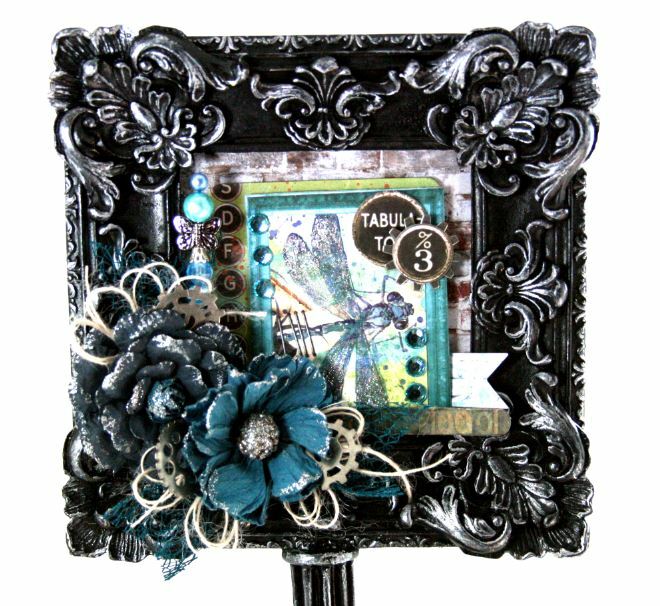 Tabbed dividers will be a great way to flip through the cards and keep them organized. 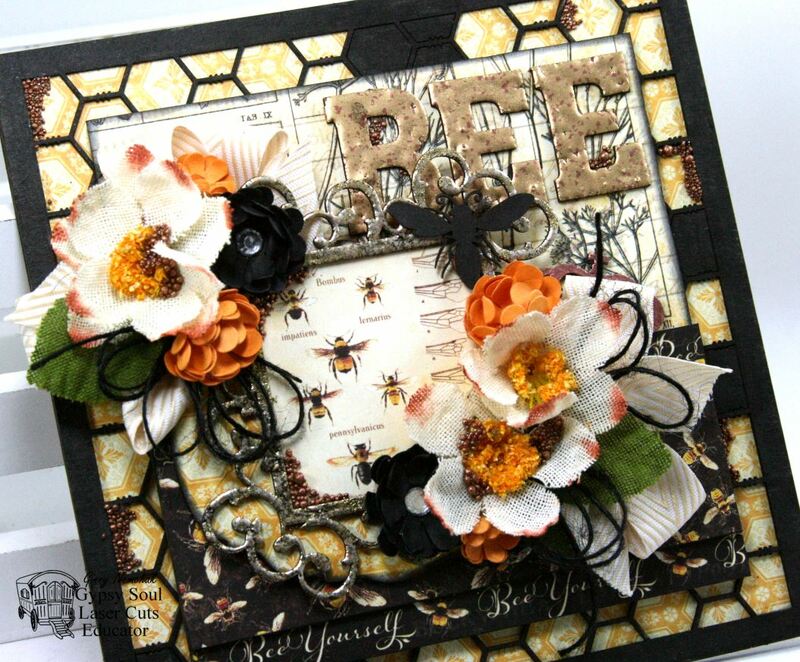 The fronts of the cards inside have the collage work and the backs are for journaling. It will be nice to have a smaller amount of room to fill up with thoughts as sometimes you want to write something inspirational and personal. Sometimes you want to say I love tacos and thank God for cats. Less pressure means more spontaneous journaling.